Museum at the Fashion Institute of Technology (FIT) | All Tickets Inc. 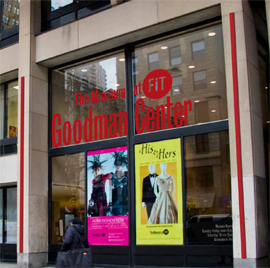 The Museum at the Fashion Institute of Technology (FIT) is called “the most fashionable museum in New York City.” The Museum’s mission “is to collect, conserve, document, exhibit, and interpret fashion.” It does so through carefully designed exhibits, creative programs, interesting publications and an extensive permanent collection of accessories, costume, textile and photographic archives. Today, there are over 50,000 garments in the museum’s collection, which range from the 18th through to the 21st centuries. Special group tours, which must be booked in advance, are available for the various collections and exhibits. Get in step with the trends of the past and understand fashion as it relates to your life today.